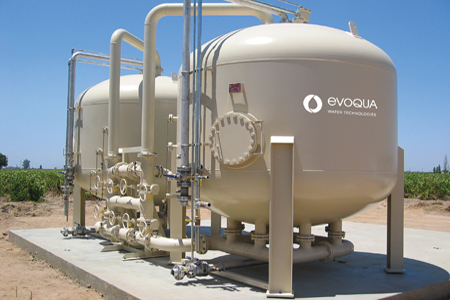 Evoqua Water Technologies is the exclusive provider of Westates® activated carbon adsorbers. Evoqua Water Technologies is the exclusive provider of Westates® activated carbon adsorbers. The HP® series carbon adsorber systems are ASME Code stamped pressure vessels designed for high pressure water applications. These modular designed systems include two adsorbers and a piping skid. The HP® series carbon adsorber systems are designed for a wide variety of water applications including drinking water treatment, groundwater remediation, wastewater filtration, tank rinsing, leachate treatment, leaking underground storage tanks, and spill cleanups. The HP® series is available in three different system models: the HP® 810 (8' diameter vessels holding 10,000 pounds of carbon each), the HP® 1020 (10' diameter vessels holding 20,000 pounds of carbon each) and the HP® 1220 (12' diameter vessels holding 20,000 pounds of carbon each). The systems are rated for flow ranges of 500 to 1100 gpm when the vessels are operated in series and 1000 to 2200 gpm when arranged in parallel.